Are Above Ground Pools Made of Aluminum? Posted on April 11, 2019 April 4, 2019 , in Above Ground Pools. When asked the question, “Are above ground pools made of aluminum?” there is no very simple answer. There are many different types of above ground pools and aluminum may be used in certain components, all the components or none of the components at all. In this article, we’ll go over the various types of above ground pools to give a better picture of how aluminum can play a role in their construction. 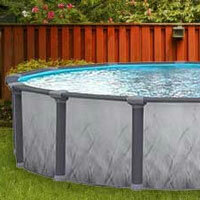 As the name says, an all-aluminum pool has all its components made from aluminum. This typically means the top and bottom tracks, the posts, the wall, the top caps and any stabilizers and connectors. Because aluminum doesn’t oxidize you won’t have to worry about rust like you do with steel components. However, aluminum will still corrode over time. All aluminum pools are usually at the higher end of the pricing grid. The main difference of these pools is the composition of the walls. Extruded aluminum makes for much thicker and sturdier walls compared with regular aluminum. This extra thickness makes them much more stable and it’ll be unlikely you’ll ever have to worry about corrosion. The wall also comes in a series of interlocking panels as opposed to the singular roll featured in most other types of pools. When it comes to a part aluminum, part steel pool, the components made of aluminum are usually the top rails and caps. These parts are made of aluminum to eliminate rust because of their constant contact with the water. The parts made of steel are normally the wall, bottom tracks, posts, plates, and posts. Steel components are typically cheaper than aluminum, so this pool won’t be as costly as an all-aluminum or extruded aluminum pool. In part aluminum, part resin pools, the aluminum components are usually the walls, stabilizing bars and top connectors. Other parts such as bottom tracks, connector plates, uprights, and top rails are usually composed of resin. Resin is a plastic material and therefore immune from rust or corrosion, but it’s not strong enough to be used for a pool’s walls. There are some pools that are called all resin pools, but this is somewhat of a misnomer as the walls still need to be made of aluminum or steel. A semi in ground pool is a mixture between an in ground and an above ground pool. These types of pools normally have extruded aluminum walls to ensure they won’t collapse and are able to remain standing when empty. The added thickness and stability of the extruded aluminum allows them to be partially submerged in ground without the ill effects that might beset steel walls or regular aluminum walls in a similar position. To learn more about above ground pools, download a pool brochure.